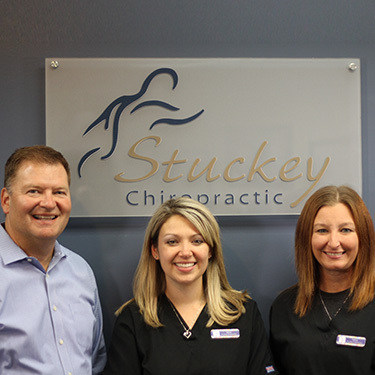 Here at Stuckey Chiropractic, we believe that good health isn’t just about feeling better, it’s about truly being better. Since 1986, we’ve been using this simple idea to help O’Fallon residents feel and perform their best. With chiropractic care, your symptoms won’t be covered up just to relieve your pain. Instead, your symptoms will be uncovered and dealt with at their core to ensure relief for now as well as long term health for the future. To examine my patients and their families, to find and correct any subluxations, helping as many people as possible to achieve and maintain their optimum level of health. To provide a kind, courteous, caring and positive environment here at the office. To have a top-notch, well-trained and professional staff which share my purpose and can effectively communicate their knowledge and concerns to my patients. To educate my patients in regards to their role in their health care, answering all questions kindly and courteously. To maintain the highest level of ethics in daily practice. When a patient walks in and looks at me and smiles big, I can tell that they’re feeling so much better and they’re pleased with their results. Good health isn’t just about feeling better; it’s about genuinely being better. Be your best, healthiest self by contacting our chiropractic office today for an appointment!